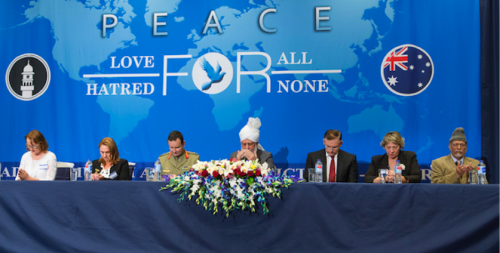 The Worldwide Head of the Ahmadiyya Muslim Jama’at and Fifth Khalifah of the Promised Messiahas, Hazrat Mirza Masroor Ahmad (aa) delivered the keynote address at a special reception held at the Princess Court Reception Centre in Melbourne on the evening of 11th October 2013. 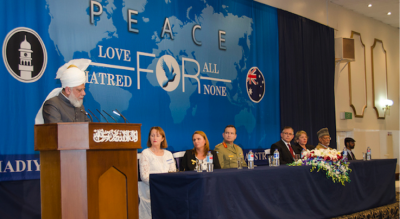 The event was attended by more than 100 non-Ahmadi dignitaries and guests, including Major-General Paul McLachlan, Mayor of Frankston, Sandra Mayer, Anthony Byrne MP, Judith Graley MP and Ingra Peulich MP. His Holiness spoke on the global financial meltdown, the Arab Spring and Syrian Crisis, and why all of this is leading the world to a global catastrophe.